After recovering from the most painful and unjust season finale in the history of LSU football, a 74-72 seven-overtime Zebra Bowl horror show which did what no other event in seven years of trying has been able to do – namely to actually create a rivalry between the Tigers and Texas A&M – we offer the following as an attempt to take a long view of where Ed Orgeron’s program is with the raw emotion of the loss taken out. At least, with as much of that emotion taken out as possible. LSU still has a good shot at the all-important 10th win. The Tigers might even get an opportunity to grab that 10th win in a New Year’s Six bowl game, as ESPN is projecting the Tigers and Michigan as a Fiesta Bowl matchup – a game the Tigers match up fairly well in. An even better matchup might be a Fiesta Bowl against Central Florida, which we think might be more likely; our expectation is that when Ohio State beats Northwestern for the Big Ten championship the Buckeyes are going to squeeze past Oklahoma (and Georgia, who’s going to lose to Alabama in the SEC championship game) into that last playoff spot and the Wolverines will then be in the Rose Bowl against the Pac-12 title game winner. Essentially, between the Fiesta and Peach Bowls you’re going to have four open spots, one of which UCF will fill assuming it beats Memphis in the AAC championship game next weekend. Florida would slot ahead of LSU for one of those spots thanks to the Gators having beaten the Tigers in October (something which has happened in two of the last three years and needs to stop – Orgeron had better demonstrate next year in Tiger Stadium that he’s capable of beating Dan Mullen, whom he’s lost to in both seasons he’s been the head coach at LSU). But after the Gators, LSU holds up pretty well against the field assuming things go according to the odds in the conference title games. Should the loss of McKinley Milton to an ugly knee injury last weekend make UCF vulnerable next weekend and Memphis were to pull an upset in the AAC title game, a New Year’s Six berth is almost assured, by our calculations. the Tigers are ranked ahead of West Virginia in both polls. So long as Washington State and Penn State don’t both jump LSU by the time the selections come around, they should be in that top tier. And if not, while LSU might tumble into one of the Florida bowls which aren’t as desirable as the program is accustomed to – as in the Outback Bowl in Tampa or the TaxSlayer Bowl in Jacksonville – the opponent they’d draw would make for the Tigers entering as a heavy favorite. It’s unlikely LSU ends up in the Citrus Bowl for a third straight year; nobody really wants that. But projections are that the SEC team in Jacksonville or Tampa would face 8-4 Northwestern, 7-5 Wisconsin or 7-5 Michigan State – all are teams LSU should be sizable favorites over. And if LSU were to end up in the Texas Bowl in Houston, Liberty Bowl in Memphis or Music City Bowl in Nashville, the opponents would be even less inspiring – in Houston or Memphis you’re likely to get 6-6 Baylor or 6-6 Oklahoma State, and in Nashville it could be 7-5 Georgia Tech or 8-3 N.C. State. 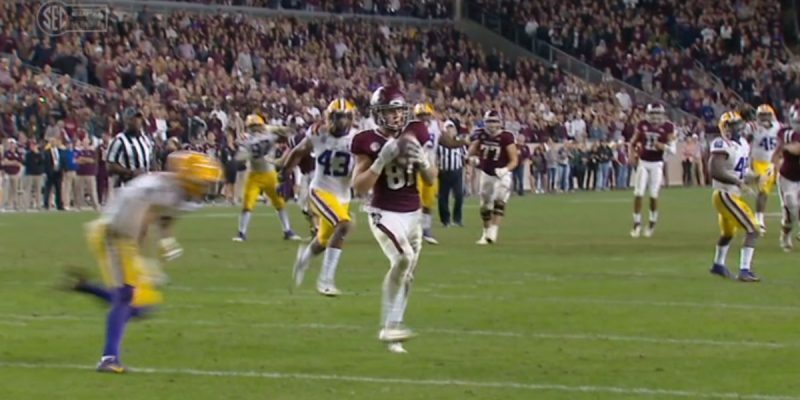 It’s possible the Tigers could be less-than-thrilled to draw such opponents in a bowl after having dreams of a New Year’s Six date, but again – remember, this is about getting to a 10-win season, and that’s a goal which to a man this team believes was stolen from them unjustly by Matt Austin and his incompetent officiating crew in College Station. The bet here is these kids would kill to get that 10th win, and they don’t care if it’s Georgia Tech, Wyoming, Augustana or the Little Sisters Of The Poor standing in their way. And a 10-win season in a year LSU was picked to win six or seven games is an important achievement. It would also signify that LSU improved its record over last year’s 9-4 mark despite playing a much tougher schedule. That would be something to hang one’s hat on, and evidence the program is indeed moving forward. Next: Give credit where credit is due – Ed Orgeron did a good job with this team.